The Polepally SEZ agitation which has been going on for the past 4 years has entered a decisive phase. Polepally farmers have used all forms of democratic protests to make their case heard. They have organized dharnas in front of MRO office, District Collector’s office and also APIIC head office in Hyderabad. In a novel protest form, 13 Polepally farmers have contested the recent Telangana Assemby By-election. 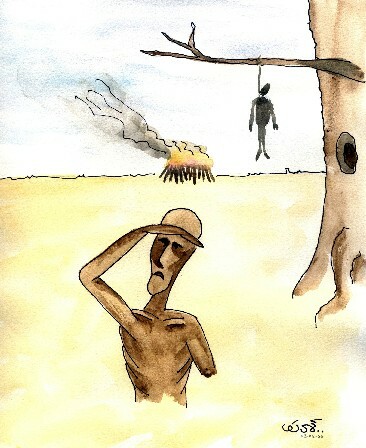 42 farmers have lost their lives due to hunger, heart break and suicides in this village after the land was acquired from them. This shows the seriousness of the situation here. From a stage where no one took notice of their agitation, Polepally has now reached a stage where every major political party, newspaper and television channel started supporting and extending solidarity to the movement. Devender Goud (NTPP), K Narayana (CPI), Nagababu (PRP) and representatives of Bahujan Samaj Party have already visited Polepally and extended their support. Now is the latest speculation that Chiranjeevi of ‘Praja Rajyam Party’ may visit soon. 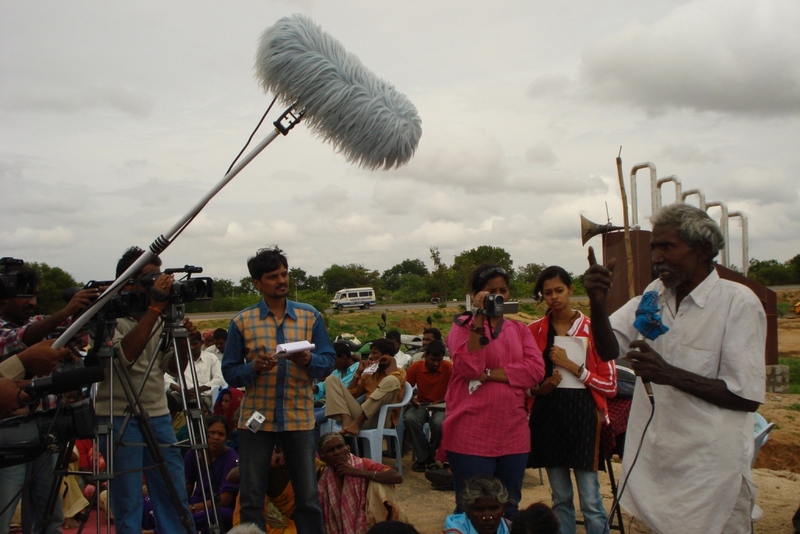 Magsaysay award winner P Sainath has visited this village and wrote extensively about this. The Polepally agitation has reached a decisive stage now. The farmers have decided to organize a Bhu Satyagraham (Protest for the Land) from the 25th of September 2008. It is an indefinite protest in front of the Polepally SEZ (Jadcherla Green Industrial Park SEZ) until their demands are met. While the agitating farmers are getting sympathies and support from all corners of the world, what they also need is financial support to fight till the end. Friends, we request everyone to contribute small amounts and extend your solidarity to the struggle. Kindly get in touch with any one of the persons below who will then let you know how you send in your donations. We Thank each and everyone who came forward to donate for the Public hearing held on 07th August 2008 , also who couldn’t donate and whose moral support we always have. Your support & solidarity is the strength that keeps us going in this struggle against SEZs ! Unfortunately we’re not able to process any transactions using Google Checkout at this time. We have a few other options for you to Donate. Please use the Contact Sheet at the bottom of this page and mention one of the following methods listed here so that we can email you the details (as we can’t share the account details here). Andhra Pradesh (India) state government has forcibly acquired about 1000 acres of farm land at Polepally in Mahabubnagar district 4 years back and is trying to establish Formulations (Pharma) SEZ in these lands. More than 80% of the land is left unused till date. Local farmers – mostly poor, illiterate STs and SCs were bullied, threatened and were made to part with their lands for as little as Rs. 16,000 per acre (some time with no compensation). The same land is now being sold by state goverment APIIC (Andhra Pradesh Industrial Infrastructure Corporation Ltd.) at more than 100 times (40+ lakh Rupees per Acre) of that price to private Pharma Companies. Many farmers (from four affected villages: Polepally, Gundlagadda Thanda, Popally Thanda and Mudireddypally) have already lost their lives in the struggle against this SEZ, 42 committed suicide and hundreds of families displaced. Polepally farmers protested against APIIC on 7th July 2008 at Hyderabad APIIC office, which is a milestone. These farmers are penniless (after loosing their livelihood) and don’t even have the means to travel back & forth to voice their anguish. ‘Polepally SEZ Vyatireka Aikya Sanghatana (PSVAS)’ is planning to organize a Praja Court by inviting Retired Chief Justice Sawat (from Maharastra), Usha Ramanathan-supreme court lawyer, Nandini Sundar academician, JNU and Activist, P. Sainath/Kuldip Nayyar and some senior journalists to the village in the first week of August 2008 (date to be announced soon), to discuss their problems and make resolutions. PSVAS can’t even afford the basic needs (hiring tents, mikes, providing food / water at events, transportation), we need your support in organizing this event. Any meager amount you donate will be of great help to the struggle. If you’re willing to donate CLICK HERE , or contact us at sez(dot)polepally[at]gmail(dot)com so that we can send you more details. If you’re not interested please ignore this message. If you think someone you know would be interested please do forward this email to them & help us spread the word. THANK YOU very much in Advance, it’s your WILL to come forward & support us in times like this that matter the most ! !